Whenever I’m looking at inspiring interiors images online, I’m always drawn to more eclectic rooms, with a mix of mid-century modern, new, vintage and reclaimed or salvaged pieces. Trying to strike that balance is difficult, but even more difficult can be finding the right pieces. What used to be a simple case of choosing a sofa, armchair and TV unit, plus maybe a console or coffee table, is now so much more complicated as no chair is complete without a quirky side table, the right lamp must dress the console and layers of rugs, art and ‘found’ objects now all finish the styling of the room. Fortunately I think the fun is in the finding, but not at the expense of having an unfinished room forever and then there’s the price tag attached to all these coveted items. So I was pretty excited to spot this Lovbacken side table in IKEA of all places. Lovbacken is actually an updated IKEA design from 1956 and so it’s mid-century looks are in fact genuine. Cashing in on the fact that we all like a bit of history and a story with our design pieces, IKEA are reissuing it for the Autumn 2013 collection available now in stores. The leaf shaped top gives it an unusual look and the rich tones of the poplar veneer (the original was rosewood) and dark legs are further enhanced by the brass tipped feet. All for just £40! I’m definitely going to be snapping one of these up for my living space, before they sell out – it’s causing quite a stir in design circles. This afternoon’s post is a bit of a rambling one, but you know what, sometimes you’ve just got to get it all out. Plus, I’m really looking forward to getting an opinion on what you guys like. Our bedroom was redecorated a couple of years ago now (I’ll share it with you guys sometime soon,) and although I still like the original style, I’m kinda ready for a bit of a switch around. One of the things we didn’t change was the bedsides. We have some classic white IKEA bedsides which I like because they are tall, but I’m really not in love with any more. Trouble is, I’m struggling a bit to find something that I really like to replace them. So they have lived to fight another day. Unfortunately, my beside drawer is a hell-hole of items that I like near me when I’m in bed. Everything from receipts that were culled in the last purse clear out, to matches, sticky rollers for cat hair and hand cream. None of which are catered for in this storage-deficient beauty. 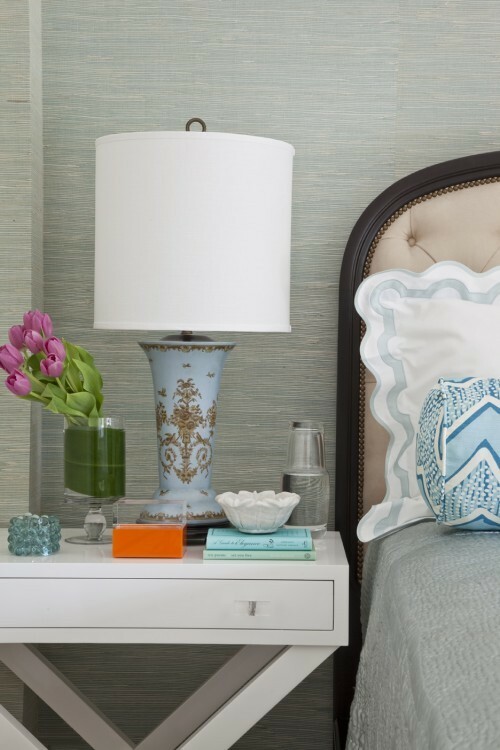 Blue bedside lamp // Acrylic (or lucite as they call it in the US) console as bedside. I’ve thought about sticking with white and I particularly love the many single drawer bedsides like the one on the left above, or whilst I was browsing for this feature, I came across these acrylic ones which give a great illusion of light and space. Here we are again with the hiding the clutter thing though. I already have a mirrored dressing table and as a result, I’ve been wondering about getting mirrored bedsides, but I’m just not sure if that’s a little too glamorous for my current tastes. I like to knock back the luxe look with a bit of rustic rough-about-the-edges-ness. I’ve seen loads of stacked up luggage options (although most are Louis Vuitton and I really don’t love that logo,) but they don’t seem all that practical either – great storage, but can you imagine unstacking them every time you wanted to get in? Blue bedside and navy walls. Right now, foremost in my mind is adding some colour to the bedroom, so the idea of a coloured cabinet is very appealing. I love turquoise, but I’m not sure how I’m going to feel about it come the winter months. Will it look out of place and ill-conceived? Well good afternoon! After all the excitement of this morning’s launch, lets settle down to some of the fabulous finds you can expect on a regular basis. We’re getting straight to the good stuff (or some of my favourites at least!) …Interiors. *Teak and Brushed Aluminium desk lamp – Cox and Cox, Cream enamel and wood lamp – Laura Ashley, Utilitarian Clamp light – Plumo. Of course, no round up of task lighting is complete without the design classic that is the Anglepoise. The 1227 is the one I’m referring to, but I love equally the slightly retro, jewel bright glass shaded 1228. It’s inspired many a reproduction and you can even get a similar look from stores like Ikea. *Blue Work Lamp – Ikea, Anglepoise 1227 in Cream – John Lewis, Anglepoise 1228 (with blue shade) – John Lewis. I do rather like a bit of a retro feel to a desk lamp, and the blue one below has an air of late fifties design about it. Traditional lamps don’t look out of place even on a modern desk (Ikea coming up trumps here again) and this white lamp would be just as at home in a sleek all-white scheme as a rustic home office in the garden shed. *Penelope Task Lamp in Slate – John Lewis, Hector Table lamp – Baileys, Nickel work Lamp – Ikea. King of Quirk, Graham and Green make a couple of bobby dazzlers if you want something really different. Not given your desk lamp a second thought? Or have you got a special piece to share? Drop a comment in the box and do let us know!